The accuracy provided by GPS (especially with WAAS augmentation) has vastly expanded the number and quality of instrument approaches available to properly equipped aircraft, including procedures that provide guidance comparable to the ILS. For example, as of January 10, 2013, in the U.S., there were 3,052 approaches with LPV (localizer performance with vertical guidance) minimums, more than double the number of category 1 ILS approaches (the current inventory of instrument flight procedures in the U.S. is available here). At present, however, approaches that take full advantage of the capabilities of satellite-based navigation remain in a special “authorization required” category. Flying these RNAV (RNP) procedures requires additional crew training and approved avionics, such as flight management computers, autopilots, and cockpit displays, as described in AC 90-101A and AIM 5-4-18. At present, RNAV (RNP) (required navigation performance) procedures, like Category II ILS approaches, are available to authorized airline crews and pilots flying business jets equipped with the appropriate avionics, but not to typical instrument-rated pilots, even those flying aircraft with WAAS-capable IFR GPS navigators such as the Garmin GNS430W/530W and newer GTN750/650 series boxes. Garmin released system software 6.11 for the GTN series on March 1, 2016. That update includes the ability to fly RF legs on approaches that are not classified as Authorization Required procedures. The presence of RF legs no longer automatically classifies an approach as an AR procedure. For more information, see AC 90-105A and the updated Pilot’s Guide and other documentation related to the March 1, 2016 update of the system software for the Garmin GTN series navigators. Garmin, working with the FAA and Hughes Aerospace Corporation, has recently completed the first part of a study that may persuade the FAA to change the requirements and make some RNP procedures available to most pilots flying aircraft equipped with WAAS-capable avionics. You can download the complete Garmin Radius to Fix Leg Project Report (PDF) published January 15, 2013, here. Figure A-13 from Appendix A of the IPH shows a hypothetical RF leg. Unlike DME arcs, RF legs are defined by points in space, not distances from a ground-based transmitter. They can be strung together into sinuous paths, that, as noted above, provide lower minimums while avoiding obstacles, airspace conflicts, and noise-sensitive areas. 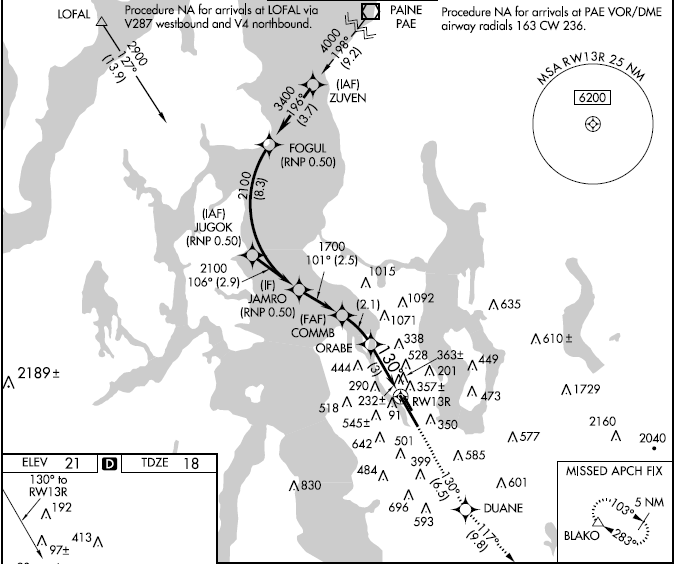 The plan view from the RNAV (RNP) Z RWY 13R approach at Boeing Field in Seattle (KBFI) shows such RF legs. You can find examples of RF legs in non-RNP approaches at Carlsbad, CA (KCRQ) and Ketchikan, AK (PAKT) [thanks to John D. Collins for those references]. Because of the restrictions placed on flying RF legs, however, those procedures are not currently available to typical IFR pilots. RF legs are also features of some RNAV instrument departure and arrival procedures (SIDs and STARs). FAA includes RF legs in procedures assuming that an aircraft can follow the curved path with great precision, hence the detailed requirements spelled out in AC 90-101A, AC 90-105A, and AIM 5-4-18. Chief among those requirements are a flight director and/or a roll-steering autopilot, stipulations that rule out many, if not most, light general aviation aircraft. Instrument-rated general aviation pilots are able to hand fly RF legs and meet the 0.5 nm 95% FTE [standard flight technical error] target and RF leg altitude restrictions without the aid of a flight director or autopilot in Part 23 Category A and B aircraft that are either minimally equipped or technically advanced…All pilots demonstrated acceptable proficiency on both straight legs and RF legs. The increase in RF leg FTE over straight leg FTE can be expected to be about the same magnitude from a minimally equipped aircraft to a technically advanced aircraft. In other words, pilots were able to remain well within the boundaries specified for an RF leg, whether flying a Cherokee equipped with just a Garmin 430W and basic instrumentation or a speedier Cessna 400 outfitted with Garmin’s latest G2000 integrated glass cockpit and autopilot. The pilots achieved this performance while hand-flying challenging procedures that incorporated multiple RF legs specifically designed to stress-test both the avionics and their flying skills. You can see diagrams of these special procedures in the Garmin report. Garmin recommends FAA revise its installation and operational guidance for RF legs to make clear that applicants may obtain airworthiness approval for installations without flight director/autopilot. To preclude the need to demonstrate adequate FTE margin for aircraft flying RF legs at greater than 200 knots without flight director/autopilot, Garmin recommends FAA revise its installation and operational guidance for RF legs to allow applicants to utilize an Aircraft Flight Manual limitation that restricts flying RF legs to 200 knots or less. 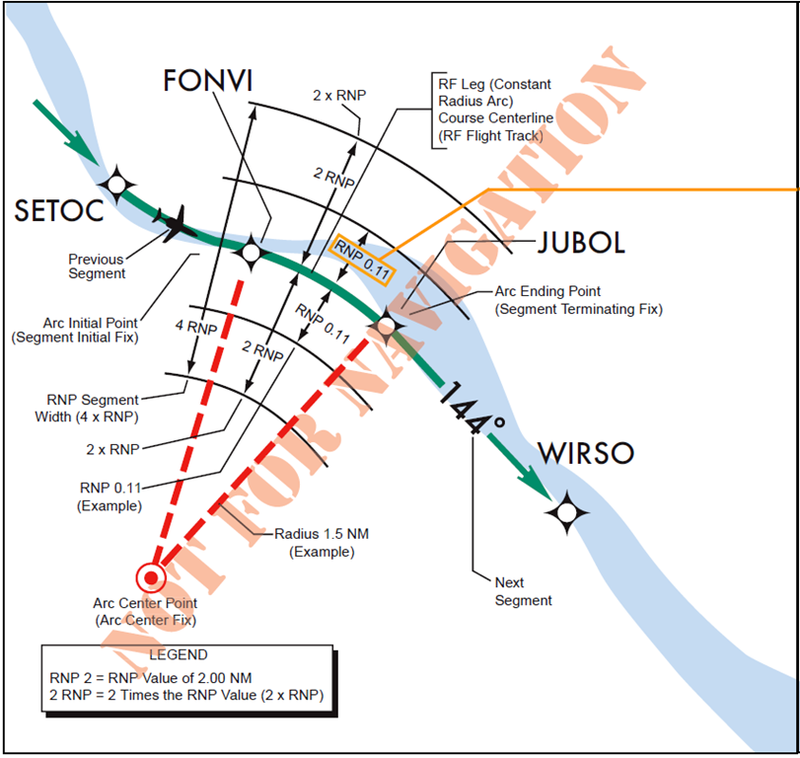 As this project has shown, FTE is decreased when a moving map is available and is thus consistent with the MLS curved path study conclusion that led to the FAA installation and operational guidance that “an aircraft must have an electronic map display depicting … RF legs.” However, this project has also clearly shown that a moving map is not required to maintain acceptable RF leg FTE, even during complex procedures and missed approaches. The executive summary of the Garmin report outlines additional conclusions and recommendations that address specific issues related to flying RF legs in typical light GA aircraft. This demonstration project has shown early success and will continue with more flight testing and data collection. But the well-designed study and detailed analysis suggest that many more pilots may in future be able to take advantage of some advanced RNP procedures, if the FAA agrees with the recommendations and avionics manufacturers and database providers include RF legs in future updates to the WAAS units now common in light GA aircraft. Garmin released system software 6.11 for the GTN series on March 1, 2016. That update includes the ability to fly RF legs on approaches that are not classified as Authorization Required procedures. For more information, see also AC 90-105A.